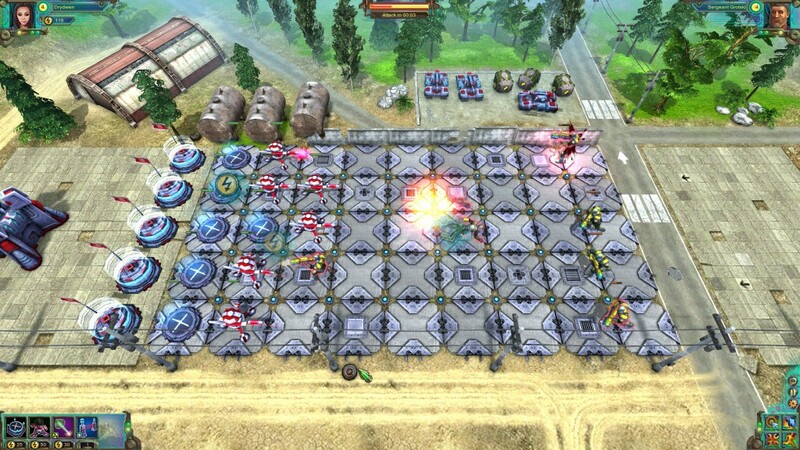 Robowars is a single player action strategy game developed by N-Game Studios and published by KISS ltd. The video game combines the well-loved tower defense gameplay with certain elements of collectible card games – ultimately feeling more and more inspired by the famous Plants vs. Zombies game, albeit with a far more serious storyline. Praymos used to be a peaceful planet, inhabited by peaceful civilians who were minding their own business. That is until mankind figured out that the planet was rich of neonium. As neonium was needed for the construction of spaceships and battle droids – serving as a power – mankind began extracting the much needed resources. As two nations, the Solar Union and the Trade Confederation, were in dire need of the invaluable resources, a war erupted. The once peaceful planet Praymos was now a battlefield were life and death was purely dependant on how much resources they could gather. Thus the Robo Wars began. The visual design in Robowars reminds me an awful lot of a futuristic Wasteland or even bits and parts of the Anomaly franchise. 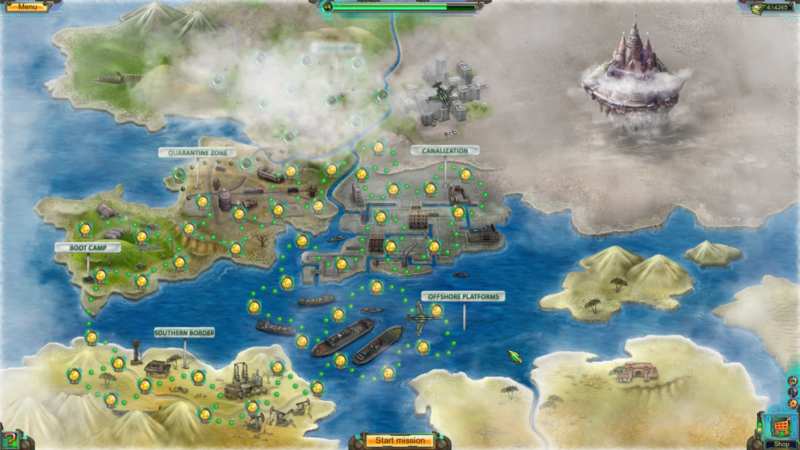 As the world map is split into several areas, the background of the battles will change from desert wastelands to flight decks to harbors to empty lots in the city. A somewhat decent change of scenery. However, the change of scenery is also the reason as to the health bars being somewhat invisible in certain types of maps. So there is definitely a pro and a con to the variation of sceneries. The sound design in Robowars is fairly annoying. When killing enemies, you’re met with the most famous “Aaah!”-sound which can be somewhat of an annoyance when you’re killing plenty of enemies at a fast speed. 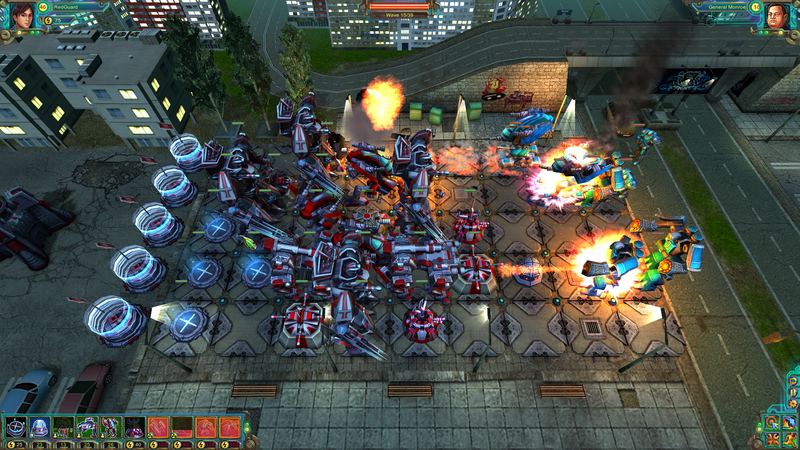 Robowars has a single-player campaign that exists of 55 story-driven missions. The first five missions are part of the bootcamp where you are trained to master the elements of the game. At a first glance Robowars seems to be a typical tower defense game but once you play through the missions, you’ll notice that the game feels more like a Plants vs. Zombies rip-off. While some might like the futuristic storyline behind Robowars, others much like me will miss the comical side of the story – the side that made PvZ a great casual game to play. The collectible card game element in the game is the many cards that can be unlocked. However, many of the cards that are unlocked when gaining a level requires you to buy certain units. Many of these units – or troops if you want to name it so – are rather expensive, especially for a one-time use only. As for the gameplay, if you’re familiar with the PvZ-gameplay, you’ll know immediately what it’s like. If you’re not, here’s a short description. Every mission starts out with a short overview of what types of enemies you’ll encounter and the view of your deck. Once ready, you’ll have thirty seconds to prepare your deck. The most important part of preparing your forces is by beginning to place down neonium reactors which will produce neonium. With that neonium, you can than proceed to build more reactors as well as your battle droids, laser guns and more to defend not only your reactors but also your base. Your base is on the left side and at the left end of each row of your battle-deck is a flag. When the battle in underway, you can place more troops. Most of these troops will be under heavy fire but you can repair these towers. However, repairing these towers also costs neonium and the enemy is packed with heavy artillery. The enemies will come in waves but these waves are so close together, it’s hard to tell them apart. Lastly, when an enemy has reached your flag for the very first time, it will explode that entire row – thus eliminating all enemies on that row, giving you mere seconds to rebuild. This is a mechanic best known from the Plants vs. Zombies game. The learning curve of the game is decent – if not quite easy to learn – especially if you’re familiar with the PvZ gameplay but the overall chances of winning are low. Therefore I would say that the learning curve is somewhat steeper than PvZ. Like they say, Robowars is easy to play yet difficult to master and I feel like that is mostly due to the fact that the rate of gaining neonium and the speed of enemies attacking your base is quite unbalanced. Due to the unbalanced gameplay, you’re somewhat forced to replay missions so that you may gain some levels and hopefully unlock better machinery. 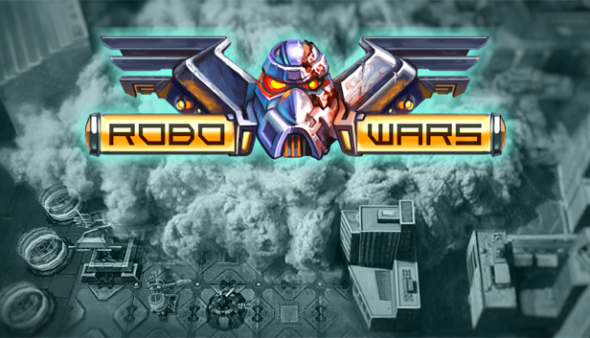 While I do like the overall gameplay mechanics, Robowars is far too unbalanced to be enjoyable. The storyline is certainly a good addition to the game but a strong storyline doesn’t make up for the unbalanced gameplay. The CCG element of the game is there but at the same time, it is hard to call it elements of collectible card games since everything gets unlocked at pre-determined levels. While the game does provide several hours of gameplay, I wouldn’t recommend it.